It was when the Ilson fans stumbled out of the bar just before kick off that the penny finally dropped with me. 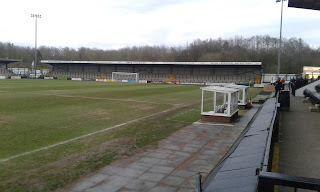 Clearly having 'enjoyed' their day long before the coach arrived at Keys Park, it was their arrival on the terraces that lead me down a train of thought that started to explain the unusual story behind the construction of Hednesford Town's stadium. Newt's - and in this case of the sober variety! 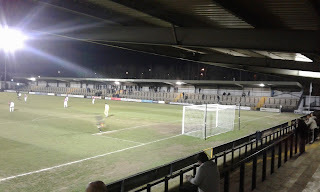 The Away End - Spot The Newt Ramp! Following promotion to the Conference in 1995, the club moved from their old Cross Keys ground to a new stadium, but it wasn't without complications during the build phase. It came to light that some rare species of newt (great crested sounds like a good shout), was in residence and indeed thriving on the site. We like newts apparently, and woe betide anyone who gets in the way of their habitat and indeed pro-creation. So, when building Keys Park, on two sides of the ground there sits an unusual wall with access points which allows the little critters to continue to do what they do without being overly disturbed. I did read somewhere that the ground is effectively on stilts, so God only knows what is going on in the underground amphibian World, but it's safe to say they've been carefully catered for. The history of Hednesford Town is an interesting one. It struck me that they are a club that perhaps don't quite know where they belong, and I shall try and explain why. Through the Seventies and early Eighties they were a West Midlands League outfit, but then won promotion to the Southern League Midland Division, where they remained until the early Nineties before gaining another promotion to the Premier Division. John Baldwin was now in charge, both on and off the field, and his backing and expertise ultimately lead to the Southern League title in 1995 and promotion to the Conference. 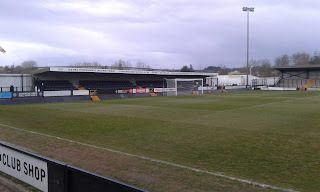 Keys Park arrived and in the first season they managed a hugely impressive 3rd place finish. They managed six seasons in the Conference before relegation finally hit them. It was during this time that their Cup exploits put them on the back page of the nationals. Victories over Blackpool (away) and York City in the 96-97 campaign saw them travel to Middlesbrough in the 4th Round, only to be defeated 3-2. Then in the next two seasons they beat Football League opposition in the way of Hull City (away) and Barnet. It was heady times at Keys Park, crowds were large, and in a stadium built to Football league standards with a capacity of 6,000, you did wonder how far this could go. Four seasons back in the Southern League followed, but then a Play Off victory saw them move into Conference North, it lasted a year and then they were moved down into the Northern Premier League. They were then shunted across to the Southern League for a couple of seasons due to geography, lost in agonising Play Off games, but then were moved North again. Finally, at the second attempt they won the Play Off Final in 2013 when FC United were beaten in front of a record crowd at Keys Park. Conference North lasted three seasons, and after relegation at the end of last season, they are now back in the NPL. It is also worth pointing out that they also won the FA Trophy in 2004, a season when they finished 20th out of 22 in the league! So, what I am getting at is that thanks to Baldwin's shrewd stewardship and considerable investment, the club reached a pinnacle that could be argued lead them to be punching above their weight. Since then they have yo-yo'd between Steps 2 and 3, but historically they were a club competing strongly in the West Midlands and Southern League regional divisions. 4412 attended the FC United game, 275 were present tonight. They can draw on a much bigger support than that, but what is the genuine sustainable potential in terms of support, and where do they see themselves in terms of status? I don't have the answer to that question, and I suspect if you are a fan of the Pitmen, it may well come down to when you actually started supporting them as to what your expectations are. 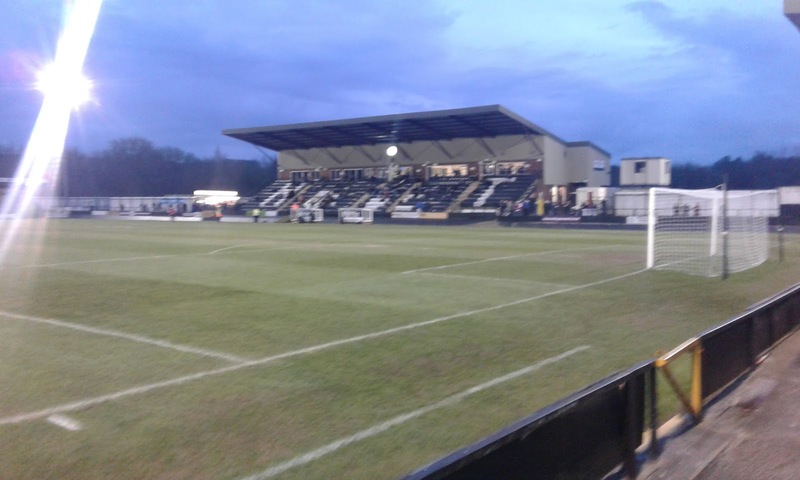 Keys Park is a fantastic stadium, Football League standard, but maybe looking a little tired these days. On the current support levels it's far too big, and you could argue that it was always too big, but they had a dream and for a few years they lived it. I saw them play Stevenage Borough in their first season in the Conference, the year Borough won it, and the place was absolutely jam packed, it was also a superb atmosphere, but where have they all gone, are they still out there? No doubt history and expectations weigh heavy, and it was noticeable in the first half hour after Ilkeston took the lead and Town toiled, that the fans quickly turn on the team. Maybe I had inadvertently chosen to stand in 'Moaners Corner' but what was clear is that patience was clearly not a virtue. Two quick fire goals before half time settled them down a bit, and in an open second period which saw both sides create chances, it was not until the third goal went in that nerves were truly settled. The best Hednesford can hope to achieve this season is mid-table, and for many that simply isn't good enough, but just what is good enough for a club that has spent the last 30 years experiencing the highs and lows that the Pitmen have? Step 3 - Surely Not?